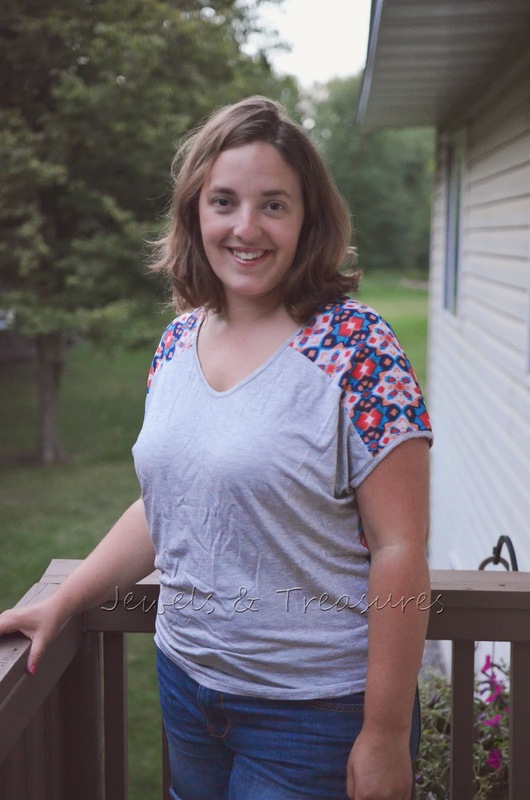 It's been such a busy last few weeks of summer and first few weeks of fall, that I have failed to post my review of my 3rd Stitch Fix and I just got my 4th a few days ago! Oops! 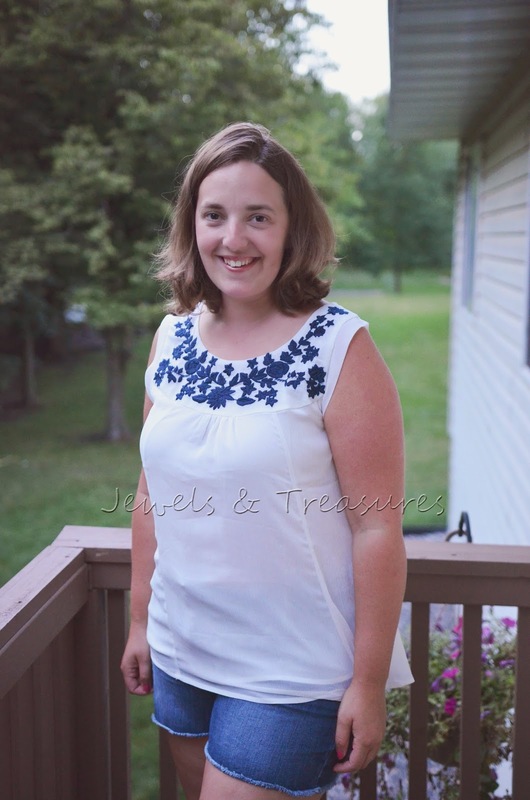 I'll be posting my 4th review in a few days, but in the meantime, read all about my 3rd Stitch Fix. For this Stitch Fix I made sure I was clear on my disappointment over my 2nd Stitch Fix and made sure they knew I wanted summer clothes. Also, because I have a love of summer dresses and because I had a wedding to go to of a good friend in late August, I requested a reasonably priced dress. 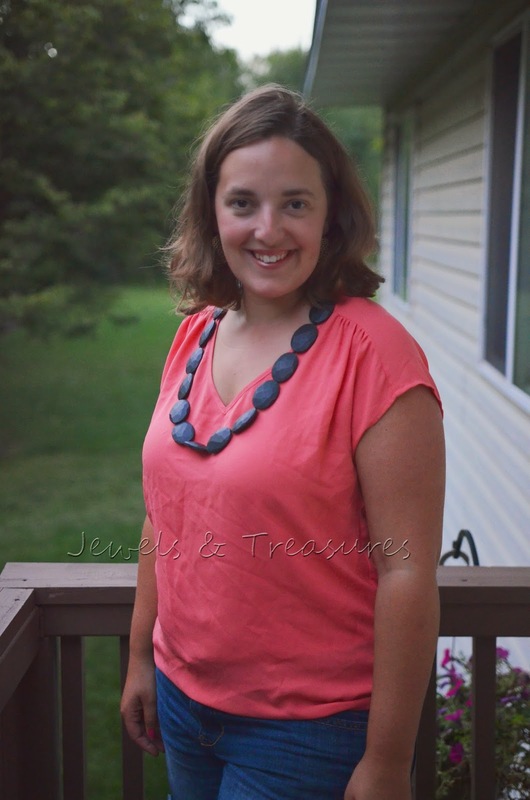 The clothes in this Stitch Fix were probably my favorite to date! 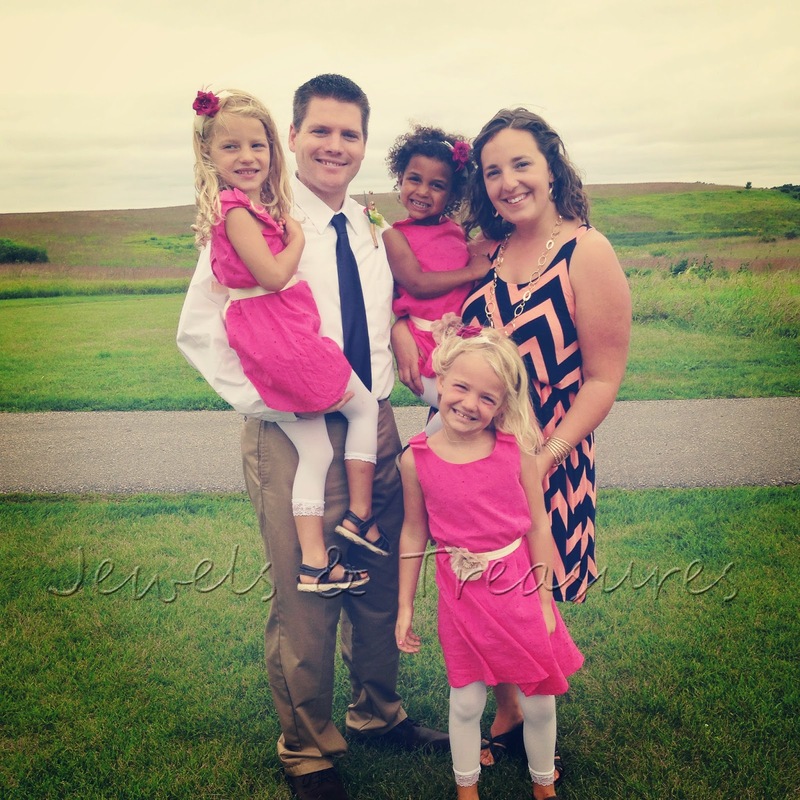 They all looked a lot like my style and I was so impressed that my stylist followed my request of summer clothes. After promising two times now to get pictures of me in the items, I finally did so this time. However, I was fighting against low light so I apologize for how dark they are! Because I was fighting the setting sun, I completely forgot to accessorize each outfit! To me wearing the right accessories makes all the difference! I wanted to like this shirt. In fact, I did at first. I loved the delicate embroidery, the soft material, and the look of it in general. However, when I tried it on, I wasn't impressed with the look of it. It fit me wrong and was too flowy, thus creating a "is she or isn't she pregnant look" and in case you are wondering, I'm not and I don't really want that, so this was a pass. I loved the color of this one right from the start! I love pink and this looked so much like me. My only hesitation was how plain it was considering the price. Ultimately, even though I liked the look of it on me, I decided to pass because of that. I was SO excited when I pulled this one out of the box! For whatever reason, I'm really into cardigans lately, and this one fit my personality perfectly with both how light weight it was and the color. I could easily style it over a tank, a shirt, or a dress. This one was an absolute keep! Picture from the wedding as my individual picture in this dress was really dark! When I saw this one in the box, I let out a little squeal! It was love at first sight. I don't own anything chevron and always have wanted to, but could never seem to find something that I love in the print. As I pulled this one out I was praying for it to fit. When I put it on, I was so happy, it fit perfectly! The price was absolutely great considering it is a dress. This was without a doubt a keeper. I've already worn it to the wedding I wanted to wear it to and received tons of compliments. Overall, I kept 2 out of my 5 items and the total came to $13 thanks to some credits from friends signing up under me. Who can beat spending $13 for two great items? 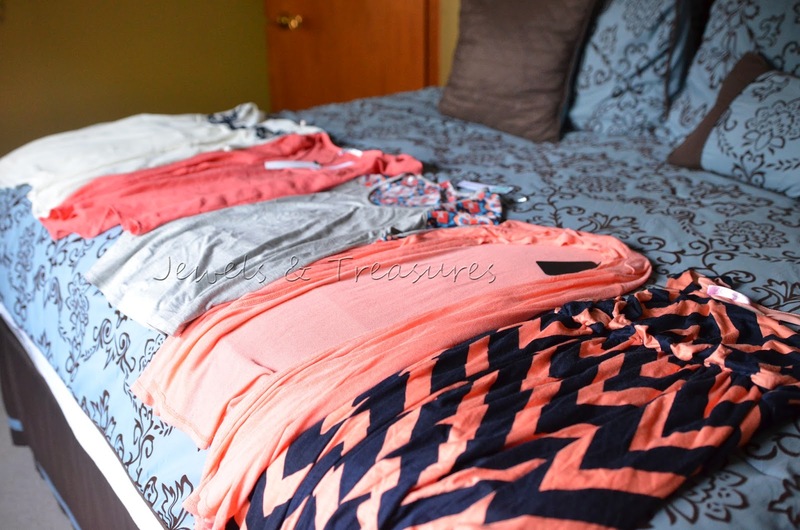 Thanks to this Stitch Fix I decided to give a 4th box a try and I'll be posting my review of that one in a few days. Haven't joined Stitch Fix yet and curious as to what it is? 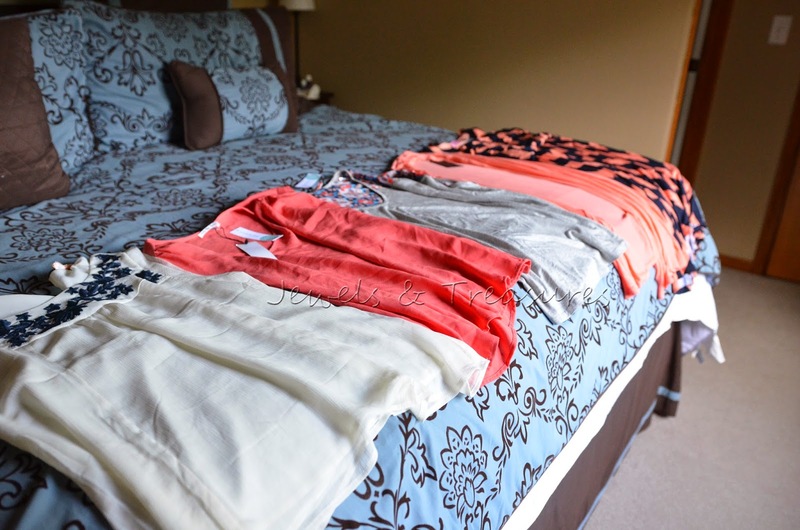 Stitch Fix is a style service where a personal shopper picks out 5 items for you, you keep what you like and send the rest back in a postage paid envelope. You do pay a $20 styling fee, but it is applied towards your final order. If you haven't joined yet, I'd love to have you sign up under me here, and feel free to leave a link or share with me your thoughts on Stitch Fix! 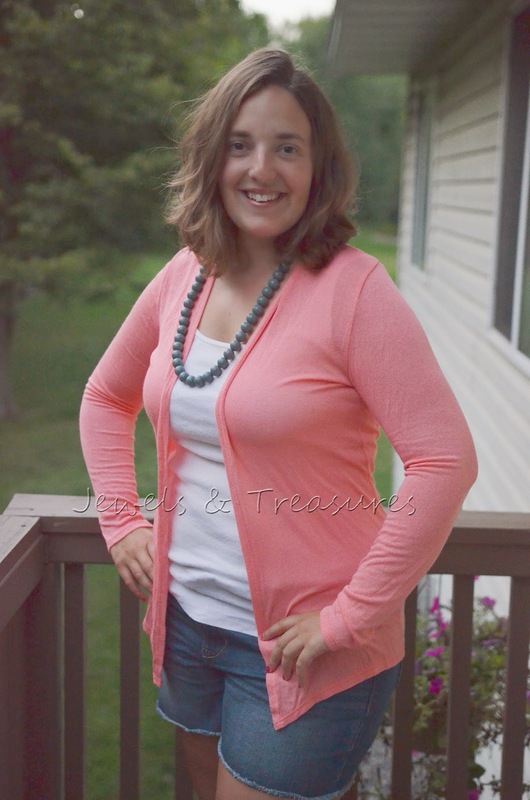 Vanessa that pink knit cardigan looks absolutely gorgeous on you! I'm really keen on giving Stitch Fix a try as I'm all about having someone doing the shopping for me :) Have you also tried Vain Pursuits? I hear it's like a beauty equivalent to Stitch Fix and I would love to know what you think!